I had not heard of this book when it was shortlisted for the Young Writer of the Year Award, and I was pleased to have the opportunity to read it – I have always liked travel writing, and I love to read about places and things I know nothing about, but still find interesting. Kings of the Yukon is based around Adam Weymouth’s journey along the Yukon river (crossing the Canada/Alaska border) in a canoe at the same time of year as the salmon are making their way along the river in the opposite direction, back inland. He writes about the salmon themselves quite a bit, their different species and habits, their life span and their habitat; and he writes about the places he visits and the people he finds there. I loved the way that Weymouth let the people along the Yukon tell their own stories, and sort of sat back and let them talk on the page. He does not try to impose his own opinions or narrative on things, and this book is much more about the journey, places, and people than about the author. A lot of travel writing is about a personal journey, some sort of self-discovery, but that doesn’t really happen here, and it was actually quite refreshing. I do like reading those more personal travel books, but Kings of the Yukon is about how people interact with nature, and how that impacts the animals, the land, and in the end the people themselves. Weymouth writes about the impact of overfishing and the bureaucracy that is put in place to control it, successful or otherwise. I felt I was learning new things right from the start of the book, which was wonderful. I also loved Weymouth’s writing style. It is simple and understated, descriptive and yet never overblown or too complex. He is clearly a keen observer, and adds marvellous details in just the right places. His fascination with his subject comes through in his writing, and you can feel that this was a journey, and a book, that came from a passion for nature and this particular area, as well as the people who live there. Stories are told of both the native First Nations people as well as those who came later; we learn about why these people came to the area – the gold rush, farming, and of course the fishing. The history of the place still seems to be present in the lives of the people that Weymouth speaks to, alive in their memories. As a British person who has never visited either Canada or Alaska, it was fascinating to learn this history and the ways in which it has influenced the lives of those in the area. Reading Kings of the Yukon was a wonderful experience outside of normal life, off to this remote place up near the arctic circle that I now really want to visit. I also loved the hand drawn map at the start of the book that shows the Yukon river and the places mentioned in the book. I very much look forward to whatever Adam Weymouth publishes next! Published in 2018 by Particular Books (UK), Little Brown (US), and Knopf (Canada). My copy was provided for review in conjunction with the Young Writer of the Year Award 2018. Identity is a theme, or issue, that I think becomes part of all autobiography or memoir; to write about oneself it to write about who you are and why. This is certainly the case with the wonderful Tracks by Robyn Davidson. She not only writes about her own experience – it is a singular, personal experience that she undertook largely on her own. There is therefore plenty of time to muse on her own sense of who she is, was, and might perhaps be. That said, she is not an especially introverted writer – the exploration of her own identity comes through the ways in which she relates to and thinks about other people, the landscape around her, and the journey she is on. Perhaps some context. 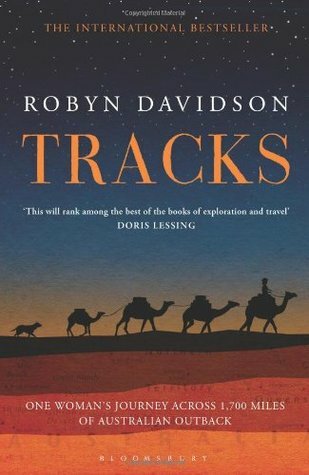 Tracks is Davidson’s account of her journey, alone, across the Western Australian desert, which she completed in the late 1970s. She knows that camels will be the most suitable animals to travel with, and to carry her things, and so the first few chapters cover the two years she spends in the town of Alice Springs trying to learn as much as she can about camels, and to get hold of some that she can take with her on her trip. This section is hugely eventful and entertaining in itself, but it is also fascinating because Davidson dedicates plenty of time and space in Tracks to examining the lives of the local Aborigine people, and the ways in which they are maligned and marginalised. She also examines the deeply sexist nature of many, if not all, men she encounters during this time. She is an intelligent and deft writer, and has a great gift for social perception and analysis. She continues to muse on the plight of the Aborigines as she continues her journey, some of it through a huge reservation, and she is hugely engaging and passionate, and I could have read her thoughts and theories, as well as the cold hard facts she presents, for hours. Before reading Tracks I did not know much about the social history of Australia, and modern society’s attitude to it, and Davidson is a great source for this. She writes not as an academic or a journalist, but just as a real, normal woman, encountering these things, and speaking about that state of her native country. It is greatly fascinating. Also fascinating is the day to day life experienced on her trek. Her relationships with the camels are emotional, difficult, rewarding, draining, and many other things besides. As an animal lover it is difficult for her to be tough with them, but her time in Alice Springs taught her that sometimes that is the only thing that works. She learns how they operate, and in turn how she must behave in order to keep them under control. She is forced to become their master, their controller, to be strict and mean when necessary, and to take care of them when they are hurt (which seems to happen very easily). Her relationship with the camels has already challenged Davidson’s view of herself – she is forced to toughen up in order to live with these animals, and to force herself through all the hardships in order tor reap the rewards. It is fascinating to read such eloquent descriptions of the spectrum of emotions she goes through on the trip, through the ups and downs – Davidson’s writing is so vivid, so personal, so completely there that you are captured and feel the emotions too, as much as you can as a reader. The fact is, as with all memoir, that we cannot ever really know what happened, how it felt, the details of life, the real experience – we can only know what is related to us. But Davidson excels in making it seem as if, when she wants us, we are there with her. She was ambivalent about having others document her trip at the time – she reluctantly allowed a photographer from National Geographic, Rick, join her for sections of the trip. His photos are reproduced in the Bloomsbury paperback edition that I have, and they really are beautiful. But Davidson resented that he was part of the outside world intruding on her experience, and that the publicity meant people she met along the way would hound her with questions and cameras. So, for me, it seems that reading her book, written by her alone, is the best way to learn about her trip. It is what she wants to tell us. There is so much more that I could say about this wonderful book. I feel like I learned a lot about what it is to challenge yourself, and be brave, and to be alone, and to be part of the world. It is a book about Robyn Davidson at that time in her life as much as it is about her journey. Her psychological and emotional journeys are as important as the physical. I was drawn to Tracks after having loved Wild by Cheryl Strayed, and while the two books do have things in common, reading them brings two very different experiences with two different women – but I hugely admire both of them. I’d say that Tracks is the more rewarding of the two. I particularly loved Davidson’s relationship with her dog Diggity (I am a mad dog person), and the exploration of the society and history that she travels through, as well as the fascinating and beautiful landscape. I just loved it, and I would recommend it to anyone. First published in 1980 by Jonathan Cape, and by several publishers since. The movie adaptation of Tracks was released in 2013. I was walking down Long Acre with my boyfriend; we wandered into Stanford’s to ogle maps and travel books. After having a wander we came to the books table back near the entrance. I was attracted to the dated-in-a-good-way cover of Travels With Myself and Another (from Eland), not only because of the layout and title but also because of the incredible photo of the author. 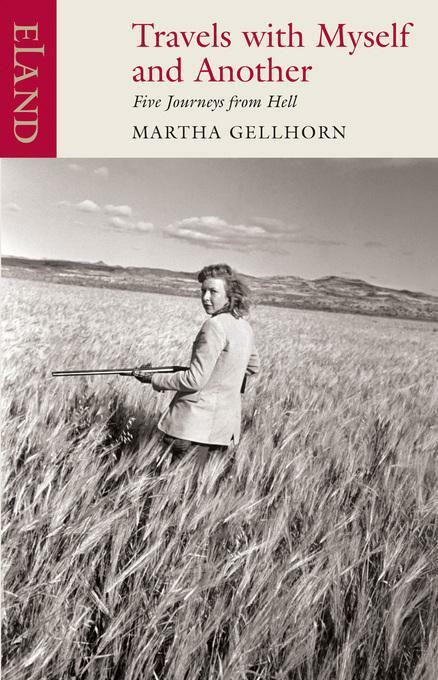 Martha Gellhorn, in black and white, turning back to the camera with a frown and windswept hair, holding a gun and wearing what appears to be tweed in a field of long grass. She looked bloody amazing and I wanted to know more. I was seized by the idea of this book while sitting on a rotten little beach at the western tip of Crete, flanked by a waterlogged shoe and a rusted potty. Around me, the litter of our species. I had the depressed feeling that I spent my life doing this sort of thing and might well end my days here. This is the traveller’s deep dark night of the soul and can happen anywhere at any hour. Gellhorn writes with a very likeable sense of dark humour and a healthy ‘buck up’ attitude that keeps her going through her worst trials of unbearable weather, transportation, lodgings, illness… and the rest. When having to deal with a useless guide, driving around Kenya and Uganda, she repeatedly tell him to buck up, as she wrangles with the Land Rover (he was meant to drive but refused to do so) and takes charge of the trip. Suffice to say I think she’s pretty awesome. 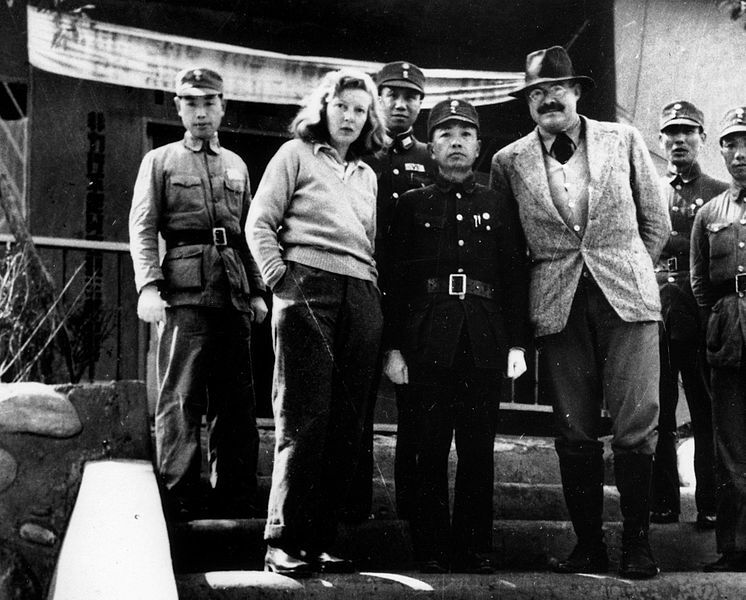 Martha Gellhorn had what I would call a remarkable life. Born in St Louis, Missouri, in 1908, she dropped out of university (in 1928) to forge a successful career in journalism. She wrote for a host of American publications as a foreign correspondent, and reported on the rise of Hitler as well as the Spanish Civil War, which she covered with her later husband, Ernest Hemingway. They were married for the duration of the Second World War, during which Gellhorn threw herself into the action. I was amazed to read in her author profile in my copy of Travels that “after Hemingway stole her accreditation, she stowed away on a hospital ship on 7th June 1944 and went ashore during the Normandy invasion to help collect wounded men” – according to Wikipedia she posed as a stretcher-bearer so that she could follow “the war wherever [she] could reach it.” No mean feat. She was also one of the first journalists to report on the liberation of the Dachau concentration camp, from the scene. I admired Gellhorn throughout the book, and particularly in the long section detailing her travels, this time recreational, in Africa, in 1962. In the penultimate year of her second marriage, Gellhorn took herself off to Africa to try and discover the real place hidden behind news reports. In both West and East Africa she meets a huge cast of diverse characters, including many “whites” who have lived in Africa for varying lengths of time. She found that even those who had lived there for more than a decade (including one married to an African and with mixed race children) still claimed to not at all understand the “blacks” and declared them to be “lower” in several ways than themselves. While Gellhorn herself finds many cultural and social differences between herself and the African people, she is not outright racist towards them and seems to be made uncomfortable by those who express such views. More than once she wonders if so-called “white civilisation” is any better than half-naked tribes in mud huts. She concludes the African people would most likely be better off if they were left to live without the influence of Europeans and Americans. That said, she views many of the African communities she visits to have gone largely unchanged in hundreds of years and does not credit them to have invented on their own, over time, any of the “white” modern inventions that colonialism has brought them, such as electricity and cars. I wasn’t sure what to make of this – but concluded that in general Gellhorn had a better attitude towards the African people than most other white people she meets, and at least respected their ways of doing things. She was a woman of strong opinions and incredible energy. Though she turned down reporting on the Bosnian war in her 80s, saying she wasn’t nimble enough, she flew to Brazil at the age of eighty-seven to research and write an article about the murder of street children. Touch-typing although she could barely see, she was driven by a compassion for the powerless and a curiosity undimmed by age. Travels With Myself and Another was originally published by Allen Lane in 1978, by Eland in 1982, and reprinted (also by Eland) in 2002 and 2007.